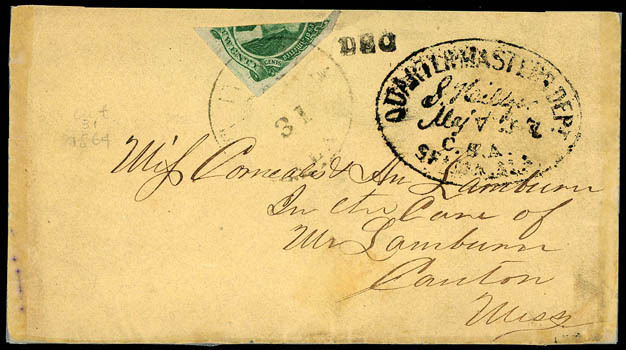 Confederacy, 1863, 20¢ green, diagonal bisect, lower right portion of stamp tied by light strike of "Selma, Ala., Oct. 31" cds on 1864 cover to Canton, Miss., with bold oval "Quartermasters Dept., Selma, Ala., S. Hillyer Maj. & Q.M., C.S.A." semi-official handstamp (WD-QM-15), with original enclosure Quartermaster's Office letterhead from Edward Hillyer and signed "Boy of Maj. S. Hillyer"; cover missing backflap, Very Fine; with 1976 P.F. certificate and 1934 August Dietz letter of attest. Scott No. 13d Estimate $2,000 - 3,000. AN EXTREMELY RARE 1863 20¢ DIAGONAL BISECT USAGE ON A QUARTERMASTER'S DEPARTMENT SEMI-OFFICIAL COVER. 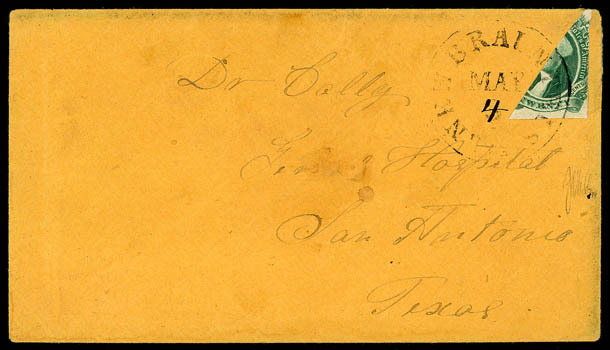 Confederacy, 1863, 20¢ green, diagonal bisect, lower right portion of stamp tied by "New Braunfels, Tx., May 4" cds with manuscript day on turned cover to San Antonio, Tx., inside addressed to Prairie,Texas and evidently hand carried; cover with tiny thins in address panel, Very Fine; with 2004 P.F. certificate. Scott No. 13d Estimate $750 - 1,000. 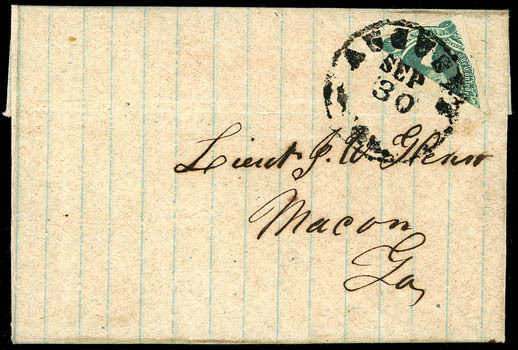 Confederacy, 1863, 20¢ green, diagonal bisect, lower left portion of stamp tied by bold "August, Ga., Sep 30" cds on 1864 folded letter to Macon, Ga. inquiring about an advertised Draftmen position, Very Fine and choice, a choice bisect usage of the 1863 20¢ Washington issue. 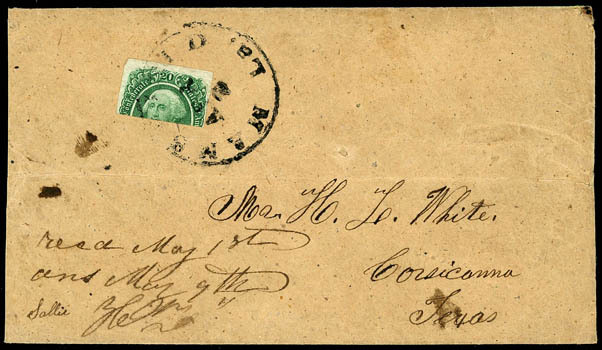 Confederacy, 1863, 20¢ green, horizontal bisect, Top half, tied by "Mansfield, La., Apr. 2" cds on homemade tan cover to Corsicanna, Texas at the 10¢ rate, cds, Very Fine and choice, ex-Hart, Myerson. Scott No. 13e; $3,500 Estimate $2,500 - 3,500. A RARE HORIZONTAL BISECT USE OF THE CONFEDERATE 20¢ GREEN ISSUE.